This AEC Reliance of Chiltern Queens is seen outside Reading General Station on 9 September 1981. I don’t know anything about her, but I suspect she came from Aldershot & District. I’m sure someone will advise. 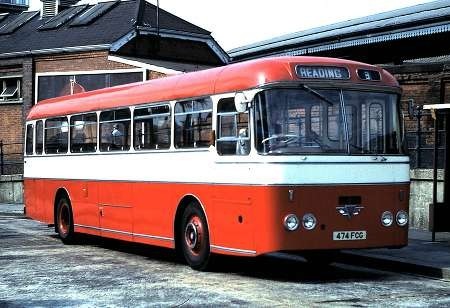 Yes, this is one of the batch of fifteen such vehicles delivered to Aldershot & District in 1963, though the first one, 466 FCG, was displayed at the 1962 Earls Court Show. A&D always had a small engine policy, and these 36ft long coaches had the 7.685 litre AH470 engine driving through the Thornycroft designed six speed constant mesh gearbox. The correct chassis designation for these vehicles is 4MU4RA. Despite their modest power, these coaches were nice to drive provided one took the trouble to treat the gearbox with respect. In 1966 came a further batch of five 49 seat Reliance coaches of very similar appearance, though this time the bodies were built by Weymann, and the 6MU3RA chassis employed the then new 8.2 litre AH505 engine driving through the AEC five speed synchromesh gearbox. 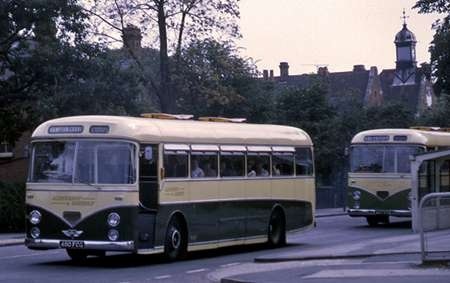 The picture shows the last of the earlier batch, 480 FCG, in a dark green and cream livery, leading 467 FCG through Farnborough on an excursion to Hampton Court in 1969. This must have been a hot day as both vehicles are in motion with the doors open, a practice that was then, as now, illegal. Thank you, Roger. It has always puzzled me a bit that Chiltern Queens, as with a number of other operators, had completely different liveries for buses and coaches, rather than the ‘reversed’ style. Their choice, of course! I’m sure Roger Cox knows a lot more than me about these things, but was it illegal to have the doors open while in motion? Some London Transport RFs had no doors while plenty of rear entrance deckers had either no doors or had manually operated ones that were rarely closed especially on town services. Comparing the two photos in this thread, someone had done a great deal of work changing the trim and the window vents. These have a passing resemblance to some Roe bodied Reliances of at around the same time although they were 30ft dual entrance examples. The Metropolitan Police were a very conservative outfit being reluctant to sanction pneumatic tyres covered tops and even cab doors! On the question of doors on buses, the regulation seems to have been that, if fitted, these had to be closed when vehicles were in motion. This then raises the matter of conductor/hand operated doors at the rear of double deckers so fitted, which were regularly seen open in service owing to the impracticability of the conductor being able to operate them at every stop. In real life, the rules seem to have been enforced as much by each company’s disciplinary system as by the law. In London, the Metropolitan Police were always reactionary in their non acceptance of new engineering technology. To the list given by other contributors may be added four wheel brakes. Phil has raised an interesting point about the greatly modified trim and fittings worn by the Chiltern Queens machine. A&D were very fond of Auster windows as seen on the Reliances in their original form, but replacing these with sliding vents would not have been a major task. The bodywork is another matter, however, and one wonders why anyone would go to such trouble. Not only have the trim lines been repositioned and the bumper removed, but the headlamps have been repositioned also. Unless this vehicle suffered front end damage necessitating a rebuild at some point in its life, the whole exercise must have been of decidedly dubious cost effectiveness. Looking around on Flickr the history of 474 FCG is confusing. It ran originally with headlamps as delivered to Aldershot and District but was later rebuilt as Roger noted and seen above. In the early shots the ventilators have all been replaced but in at least one later shot it had managed to acquire one of the Auster vents back. They also had 478 FCG (at least) which had the headlamp modification too, but on which only half the ventilators were replaced. It’s worth noting that both had their original coach seating replaced by bus seating. If you look at the photo of the Chiltern Queens vehicle carefully, you will see that it has also been fitted with two piece power doors. The front dash appears to be a replacement of the original. I am therefore wondering if A&D (or AV) did in fact carry out the modifications themselves, when the vehicle was downgraded from coach work? Ironically, the Captcha code I had to enter here included the letters "DP"! Initially, I thought that the 4MU3RA chassis designation in the heading was an error, as this batch of coaches were delivered to A&D as the 4MU4RA type. However, given the extensive alterations subsequently made, I wonder if the Thornycroft six speed constant mesh gearbox in 474 FCG might have been replaced with the five speed AEC synchromesh box, which would have been much easier to use on normal bus work. Looking through Buses magazine April 1975, under Alder Valley it was reported that "AEC Reliance 338 (474 FCG) a 1963 vehicle with Park Royal DP49F bodywork has been sold to Chiltern Queens, Woodcote". Buses magazine also records further ‘FCG’ withdrawals in 1976: 336 (472 FCG) with C49F bodywork, which went to the Transport and Road Research Laboratory (TRRL), Crowthorne; 337/8 (473/80) also reported as C49F; fire-damaged 370 (466 FCG) which was recorded as being DP49F. It would appear that some of the batch were converted at some point to dual-purpose vehicles, which may explain the revised trim on 474 FCG. However, on Flickr ‘hivemind’ there are two photos which show 474 FCG operating for Chiltern Queens with and without folding doors. Unfortunately they are both offside shots, but no folding doors are visible on the black and white photo, whereas they are on the colour view. So it would appear that the powered door conversion, and probably the bus seats conversion, were carried out while the Reliance was with Chiltern Queens. Unless as the saying goes "someone knows otherwise!". On the question of the legality of leaving doors open while the bus was in motion, I have no idea. The LT Central area RFs were without doors and I was working in the PSV section of the Metropolitan Traffic Area in 1963 or 1964 when a call came through saying that a passenger had been killed alighting from an RF while the bus was moving. At that time, it was common for many, usually male, passengers to jump off as the bus was coming to a stop. That was OK with rear entrance and forward entrance vehicles, but the front entrance RF was turning left at the time and the front nearside wheel was sticking out and caught the poor man before the driver could stop. Horrible! I only hope it was quick. This might be something on which Chris Youhill could comment: in response to complaints about poor ventilation/over-heating in Leeds’s (fixed/panoramic-windowed) 33ft "Jumbos"/"Tommy Lord Boxes" the GM, Tom Lord, informed the "Evening Post" that in hot weather drivers would be allowed to run with the front doors open . . . a stiff reprimand from the Traffic Commissioner’s Office followed. Talking about poor ventilation, last year I travelled on a new Blackpool tram. It was May and not an unduly warm day, but the tram was uncomfortably warm and I noticed the conductors were in shirts//blouses. When I remarked that aircon would have been useful, especially as it was electrically driven, they said that the drivers’ cabs were going to be fitted with it, but not the passenger compartments! That’s quite correct, Mr Hebbron – the passengers don’t matter to most operators. After all, they only keep the firm going and pay the wages! Neither do they care about the conductors, Pete D, who have to work on the trams all the time, whereas the passengers do, at least, get on and off! The above AEC Reliance chassis No 1598 fitted with a Plaxton Consort C41C body No 2355 was supplied new to Batty Holt Ribblesdale of Blackburn Lancashire in 1958. I bought the coach off a preservationist in Farnham Surrey in 1982 who had acquired it from Chiltern Queens of Woodcote, Oxfordshire where it had operated for a number of years in their fleet. Still in that livery I rallied it for almost 3 years before selling it to Whittaker Tours of Walsall who began to use it on vintage tours, weddings etc. It then went to some travellers where it has remained for a number of years gradually becoming more dilapidated. It certainly was a nice coach to drive and travel in 1950s opulence when I had it. There are other photographs of the above Reliance to be seen here. Several photographs of this vehicle appear on the website http://www.travellerhomes.co.uk under the ‘AEC’ heading. Be warned that the sections of this site are not in alphabetical order (it is, after all, run by hippies!) so you will have to scroll downwards to find the AEC bit. According to this site the vehicle was advertised for sale on eBay (or as they prefer "greedbay") in 2009. Has somebody bought it for re-preservation? I hope so. What a beautiful looking vehicle indeed. I have driven many a thousand very happy miles in virtually identical coaches with Wallace Arnold Tours of Leeds, who had a large number of them. They were extremely nice to drive, had an excellent performance, their reliability was legendary (no pun intended on the model name) and the passengers found them comfortable and pleasant. You lucky person, Chris. Reliances had left front line service by the time I gained my licence. I trained on an ex Chiltern Queen ZF 691 Reliance and ZF Reliances are my favourite vehicles. I was brought up in Sheffield on SUT Reliances of all descriptions. Anyone need help to drive their preserved Reliance? The magnificent ZF/690 Reliances caught us all napping at Wallace Arnold David. Until you got the hang of the unfamiliar gearbox the way that third and fourth gears seemed to be "anywhere" between first and second on the left and fifth and sixth on the right could be most embarrassing – we desperately "stirred the tub of treacle" hoping to find third and fourth until it eventually dawned on us that there was a gentle spring preventing unintentional selection of fifth and sixth – and then these lovely smooth powerful vehicles showed their true gentle and civilised nature. Sounds as if you’re as big a fan Chris as I am! I was trained how to use the ZF. Good case for type training!!! Indeed David – and on reflection I’m just wondering if my memory is playing tricks ?? WAS the gentle protecting spring on the right, or was it it on the left of the gate to prevent unintentional engagement of first and second gears ?? I did my training on said vehicle when it was about 26 years old. I don’t know, or remember, how the springing was set up but it was supposed to centre the lever on the 3/4 axis. This it tended to do quite well, as I remember, although age wore the linkages – and with misuse (normally due to ignorance of how to use it) could make accurate selection of gears a bit haphazard. I remember a Western National driver, shortly after they had taken over Devon General, making a total hash of driving a DG 6U3ZR from Plymouth to Exeter. My problem, as a rookie, was selecting reverse rather than second – when setting off – due to being too brutal with the gear lever. My instructor reckoned I was responsible for many a case of "brown trousers" when I set off in reverse from traffic lights in Reading! Thanks for those experiences David. I seem to remember now that 1/2/3/4th were normal and you had to overcome the spring to find 5th and 6th, and when changing down let the lever come out of the spring and locate and "settle" itself ready for 3rd and 4th. This would explain the possible pitfall, which I also remember, of engaging second instead of reverse or reverse instead of second when moving off in one direction or the other. As a former Chiltern Queens driver I have happy memories of this vehicle as it was always a favourite with drivers, went well, and no body noise at all, the only problem was watching your speed as it went so well and ran quietly. Thanks for the memory. Yes super vehicles, PMT had about 6 Duple Commander bodied coaches and if drivers tried to pull away in second gear they would tend to go over the second spring in the gearbox and select reverse gear whoops!! The secret with this gear box was to treat it like a woman, nice and gentle. Good fast buses. PMT coach number C989 reg 4989 VT was an AEC Reliance 2U3RA ZF 6 speed gearbox won the Brighton Coach Rally in 1964. I was highly amused Michael to read of your most gallant method of remaining in favour with the ZF gearbox, and I would totally agree that it is the best course of action. It has to be said though that the theory can by no means be applied universally to other gearboxes, and I can think of a few models which would treat such gentlemanly conduct with noisy and stubborn contempt – I’m sure other people have had similar "confrontations" with challenging but nevertheless noble vehicles – the Foden PVSC6/Gardner 6LW remains etched in the distant memory, and must take credit for ensuring that I still have a seemingly healthy ruddy complexion half a century after my last battle with the type !! Interesting comments about Reliances and ZF gearboxes. Maidstone & District used this combination in their express coaches, (‘SC’ in M&D terminology), and they were an absolute delight to drive. Based at M&D’s head office in Maidstone in 1966/7, I had the rare privilege, whenever I went up to London, of being able to suggest to the driver that he might care to take a rest, and drive the coach myself instead. They were just exhilarating: very fast, comfortable and extremely well-mannered in every respect. However, I was mildly surprised to read about people making mistakes when operating the lovely 6-speed ZF gearbox, and Chris’s and David’s comments on accidental selection of the wrong gear rang no bells at all. (You’re right, Chris, the spring was between the 3rd/4th gate and the 5th/6th gate, so when changing from 5th to 4th, say, the technique was to drop into neutral, then hold the lever gently against the spring. Maybe my ignorance of any difficulty with using the ZF box was because the vehicles were then brand new and had suffered no wear in the linkages, but as Michael Crofts points out, they responded best to gentle treatment, and the lovely M&D was a very gentle company! Roy. Chris and my post are almost a year old. My problems were when I was learning (before I passed my test) and, to be fair, Chris probably meant on first encountering the beast. Subsequently, I have driven thousands of miles with no problems with AEC, Leyland, Volvo, DAF and Dennis applications of the 6 speed ZF. Roy and David, yes, just to confirm my comments on WA drivers being "caught napping" with the new AEC Reliances and the freshly introduced ZF six speed gearbox – a gearbox so totally different from the previous very familiar positive and easy five speed one with which we were all so familiar daily. Of course, as with the norm, there was no mention by the Company of the development and no familiarity training of any kind, and so a little "puzzlement" was to be expected – but we soon came to grips with it and, as everyone above has agreed, the gearbox and the chassis in general were superb – smooth, quiet and fast but totally civilised. I don’t think I dare put in print the top speed that the Reliances could achieve, but they improved the Leeds – Southend Airport feeder running times to come a close second to the aged aeroplanes in which our passengers were to cross the Channel !! Pre-tacho and motorway speed limits, I was a passenger on a 760 which did over the ton – EASILY, and with no effort – on the A1, south of Scotch Corner! I have no further questions Mi’ Lud !! All this talk of speed awakens more memories: when driven in a way of which Chris would disapprove, some buses (not coaches)- possibly CVD6’s- or aged Barton PD’s ?- used to "chuff" when "given their head" on the open road: they were probably doing all of 50…? Could we have an expert interpretation? Well, David, I just can’t compete with your experience of going at over a ton on the A1; 70mph on the Swanley by-pass was the best I ever managed, but weren’t the Reliances lovely when they were moving at speed? As for Joe’s query, could the ‘chuffing’ be the effect of the governors? Reliances were lovely at any speed but not for nothing do I dub them them RR of coaches! We had two batches of AEC Reliance 590 with ZF gearboxes at PMT. 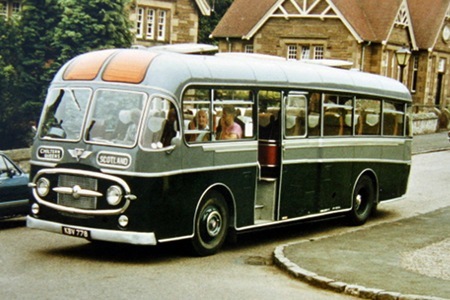 The six Duple Commander bodied coaches were prone to overheating when driven for long periods in 6th gear. We blanked off 6th gear on all of them for a time and fitted C991 with two radiators in tandem in an attempt to cure the problem. Time dulls the memory, I can’t remember the conclusion to either experiment. The other five had Weymann DP bodies and spent most of their time on stage carriage work, latterly as OMO vehicles. To say they were unsuitable for this work is an understatement!! Most drivers managed to find 2nd and then the next gear was 5th!! I have to confess that I never mastered the 6 speed ZF – nor for that matter the AEC 6 speed constant mesh fitted to the short Reliance coaches. The ex Stratford Blue Tiger Cubs were easy (to me) by comparison. As I have said elsewhere, Ian, the 590 was AEC’s Achilles heel which gave them an undeserved reputation through its propensity to boil. It was a wet liner. Its predecessor and successors were dry liners – and didn’t have this problem. Unfortunately the damage was done and many, including Wally Arnold forsook AEC for Leyland. In 1981 during a get-together in Leeds we were taking on an excursion to York in a 6-speed Leyland Leopard that sounded different from the near-silent ZF unit. I asked the driver, who told me it was an AEC six-speed box. Back at Leeds he kindly offered me a go round the block. The change was beautifully positive and you could hear the engine just well enough to get clean changes. It struck me that this was an ideal chassis-gearbox combination. I can’t remember the name of the coach company or the registration of the Leopard or why it had been so fitted. Triple amnesia! The ZF Leopard was offered as a sop to disgruntled AEC operators when AEC was closed down in 1979. Famously, both Yelloway and Premier of Cambridge has ZF Leopards after they could no longer get 760 ZF Reliances. Many went straight to Volvo (B58 or B10M) and missed out Leyland. I know a number of southern independents bought ZF Leopards in single numbers but I’m not au fait with Leeds area to know who might have had your ZF Leopard. It would never have replaced – or bettered – the 691/760 Reliance, but just think how much better the Leopard would have been had they offered the ZF earlier. There is a conflict of dates as the "hippy" website claims it was awaiting sale in 2009 but the post restoration picture appears to be January 2008…maybe the camera date coding is wrong but whatever the reason..KBV 778 lives! I hate to be the bearer of bad news, but the photo on Flickr was taken in 1986 – see the original text under the photo on this website for the reference to it being preserved in "Whittaker" livery. The date of 2008 on Flickr refers to the time when the photo was scanned and uploaded. If only you were right! Neville… I’m sorry. I just did not realise what "86 JL" meant and was pleased to see the coach apparently restored. I’ve gone back through the travellers website to check on how my confusion was fostered seeing the coach in a new livery. 1. In Geralds original picture it is in Chiltern Queen’s dark/light green scheme. It’s such a shame and I guess may by now have been broken up or at best deteriorated even further. Again, my apologies to everyone for the confusion and hoped for "restoration". We can live in hope, Richard – but more to the point – we can help and support those wonderful people who are able to restore and preserve these classic vehicles – and even better – run them at special gatherings throughout the year. David.. indeed you are right about appreciating the work and skills of the restorers. After my last posting above, I noticed that on one of the earlier pictures it now says "Sold in 2010 to..?" so it appears to have moved on but to what fate? ………and we should mourn the breakup of classic bus collections, like CPPTD in Broad Street, Old Portsmouth, forced on them by re-development and an unhelpful local council. Also, the likely demise of Aston Manor Road Transport Museum, under threat of closure. With additional council rent, they would have to charge £8pp for ALL visitors. And the purchase, the price was exorbitant. Ah what happy memories, the Reliance with ZF 6 speed gearbox, although I worked for Southdown at Eastbourne depot I got to drive East Kent’s 590 engined models on the old South Coast Express service to Bournemouth etc as changeovers with drivers, usually from Thanet depot, was a regular occurrence especially in summer, after our usual fare of manual gearbox Leopard’s this was pure Heaven. Other of your correspondents have commented on selecting 3/4 gears I always found that when coming out of 2 or 5/6 that taking all pressure off of the lever using only the palm of your hand would let it stand in the centre of the gate just right to gently slide into 3rd or 4th gear, a gentle touch was all that was needed. Any attempt at heavy handedness almost always ended in failure and confusion all round used properly along with the performance available they were a total pleasure to drive the powerful brakes and light clutch only improved the experience. When I moved from Tynemouth and Wakefields ‘Northern General’ to Armstrong Galley the coaching division of Tyne and Wear PTE, most of the coach fleet was made up of Leyland Leopards with semi auto air change boxes, but we had two older Duple bodied AEC’s with six speed ZF’s, as a result all our drivers had to have any type licence. I don’t know if they had a 590 or a 760, but if they could get a grip I’m sure they could have scaled the North Wall of the Eiger. I would say they were a better vehicle than the Leopard, although the steering on the Leyland was more positive and the AEC’s had a tendency to wander slightly in comparison to the Leyland, but overall they were a nice vehicle to drive. My first experience of the ZF gearbox was in the Aldershot and District Park Royal bodied 4MU4RA Reliances, which had the AH 470 engine. I did much of my PSV training and a great deal of subsequent driving on the Halifax Nimbuses, which had a six speed constant mesh gearbox that responded to light, sensitive handling. As I recall, the ZF boxes had a similar gate layout to the Albion, and light detente springs centralised the stick in the 3rd/4th plane. The subtlety of this arrangement was entirely lost on those of the ham fisted fraternity who would berate the gearbox on account of their own incompetence. Properly used, the ZF box was very satisfying and gave even the modestly powered Aldershot examples a fine turn of speed. Later, I drove several of the more powerful 590 engined/ZF model, which confirmed my earlier impressions. The 6-speed gearbox of the 4MU4RA was quite different from the one on the the 590s, and I always understood it was an AEC unit, not ZF. The code after the U is 2 for Monocontrol, 3 for synchromesh, 3Z for ZF synchromesh (although I’m not sure that the Z was added on the earliest ones) and 4 for constant mesh. Peter. The 590 ZFs were 2U3RA (or 4U3RA air suspension variant). The Z was only added when the 6 variant (691 and then 760) was introduced [6U3ZR]. The A was dropped from the end because, by that time, there were ONLY air brakes offered. The 6 speed constant mesh (as in 6MU4R) WAS an AEC unit, only available on the medium weights. I have read somewhere that the AEC six speed constant mesh gearbox was originally a Thornycroft design. Until the death knell of the Leyland coup de grâce, Basingstoke works became the main AEC gearbox factory after the Southall takeover. Alan Townsin’s book, Blue Triangle, seems to make no mention of the AEC 6 speed constant mesh unit being fitted to the Reliance, though this is not absolute evidence. The fifteen 1963/4 Park Royal bodied Reliances numbered 466 to 480 of Aldershot and District were early examples of the 36ft long variant, and I am sure that the gearboxes were of ZF manufacture. Chassis of the same specification were supplied to City of Oxford. 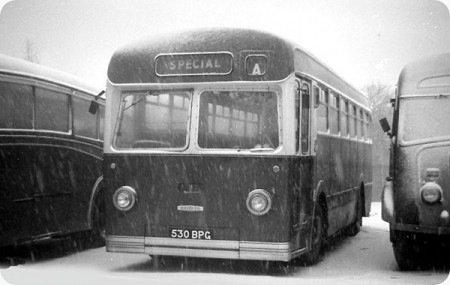 A later Aldershot and District batch of five Park Royal bodied 36 footers had the standard 5 speed synchromesh gearbox. Hebble had four Park Royal-bodied service buses (131-134, BJX 131-134C), and two Duple Commander-bodied coaches (18/19, DJX 18/19D) on Reliance 470 chassis fitted with the 6-speed constant mesh gearbox. After this their next shorter coaches were 505 models, reverting to the AEC 5-speed synchromesh box, and the longer ones were 691 models with the ZF 6-speed synchromesh box, before then going all Monocontrol. A few years back some work colleagues of mine owned a preserved ex-Greenslades Harrington Cavalier (with Grenadier front), which also had the constant-mesh box. This constant-mesh box produced an entirely different sound to the synchromesh one – deeper and less whiney. Another former work colleague of mine at Halifax had been a fitter in the last days of Hebble. He recalled one of their Reliance 505/Plaxton coaches (20, FJX 171E) suffering a gearbox failure in Cheltenham whilst on its way to Paignton on the South West Clipper. A changeover had been provided locally, but by then no other operator would provide assistance to Hebble, since it was becoming too frequent an occurrence. Rather than the suffer the ordeal of trailing from Halifax to Cheltenham and back with the tow-wagon, he and his mate were instructed to fetch Park Royal bus-bodied 134 (BJX 134C) in out of the yard, remove its constant mesh gearbox and take it down to Cheltenham in the van, where they were to exchange it for the synchro’ box in the coach, which could then replace the changeover, presumably on its way back from Paignton, and return home. The failed box was returned in the van, quickly repaired, and then rather than wait for 20 to come back home, it was fitted straight into 134 so that it could get back out into service. So for the rest of their working lives 20 and 134 had the ‘wrong’ gearboxes. Eventually 134 passed to Halifax J.O.C. as their 3320, but it was withdrawn before I had the chance to drive it – the other three 131-133 passing to Yorkshire Woollen. During the West Yorkshire PTE era, Calderdale District were briefly allocated two 36ft. Reliance 505/Plaxton coaches transferred from Bingley’s (52/53, OWT 297/8K). These had the AEC constant mesh box also, and though the older private hire rota drivers seemed to manage with them, on the occasions they found their way onto normal service trips, the regular drivers seriously struggled, most never having encountered crash gearboxes before. Our hilly terrain, and the lack of ‘go’ from the 505 engine in a 53-seater coach didn’t help. My only encounter with the ZF box was in the later Leyland Tiger coaches. As Roger says, the secret of selecting 3/4th gears was to almost let go of the lever and let it find its own position between the détentes, then lightly push or pull the lever. It was OK when you were out on the open road – able to plan ahead and keep your cool. The trouble was that when you only drove them occasionally, and maybe not for very far, when driving in heavy urban traffic situations you could suddenly find yourself having to do an unexpected quick change and get in a panic. Then it could all go horribly wrong ! On one of them, Jonckheere had lowered the driving position, and in the process had to bodge all the linkages. This one was absolutely dreadful. Getting a bit too modern now though, so I’d better finish. Just in case anyone notices that Bus Lists On The Web has A&D 466-480 as 4MU3RA, this is probably a red herring, as Peter Gould’s site agrees with Roger that they were 4MU4RA. As I said above, the 4 means constant mesh (well strictly speaking it means non-synchromesh, since synchromesh gearboxes are constant mesh as well!). We know that the 3 could refer to one of several synchromesh gearboxes, so it is theoretically possible that the 4 could refer to more than one gearbox as well. But the crucial thing is no synchromesh. Personally I have never heard of a ZF box without synchromesh. North Western’s last batch of Reliances were 36 foot long machines, fifteen being buses and twenty dual-purpose, all on 2U3RA chassis. The last ten (941-952) were fitted with the ZF six-speed gearbox which I believe is what is being referred to here. Peter Caunt, in his book on driving reminiscences with North Western, recalls these as having a close gate, as described, which took some getting used to. He had little chance to wind them up but says then when you changed up from fifth (at about 55 mile/h) to sixth what usually happened is that speed dropped by about 10 mile/h! I suspect there was quite a ratio gap and the engine was delivering sufficient power at the low revs. As ever, 6 speed ZF covers a multitude of sins – many different versions with differing ratios. The AEC application – only on heavyweights – had an overdrive sixth gear. [That would explain the speed drop – although it did not necessarily happen if driven "properly"]. When Leyland withdrew the Reliance from the market and offered a 6 speed ZF on the Leopard, in 1979, the Leyland application had a direct sixth gear (1:1). The Dennis Dorchester and Seddon Pennine VII had there own versions (Eastern Scottish even having a 4 speed ZF variant). The early 36 footers for North Western and the batch including No.9 for Devon General shared the same 4 speed synchromesh AEC gearbox as the SUT BWB registered Plaxton coaches of 1962. As such, they sounded totally different – more like a Regent V.
Peter, having trawled again through all my literature on AEC, I confirm that you are correct on the subject of ZF gearboxes fitted to Reliances – they were always synchromesh. For the last fifty years I have laboured under the misapprehension that the A&D 466-480 batch had ZF boxes. We are never too old to learn! …..but ZF’s latest, superb, gearbox – the AS-tronic automated gearbox – has no synchromesh on it at all. [The computer doing the changing, the extra weight of the synchromesh was thought to be superfluous.] Volvo obviously agree as their iShift is similarly endowed, as is, I believe Scania’s version.